A food discovery of Tutubi suggested by his adventurous but "misinformed" sister who directed him to drive to the town of Famy, but wary of his sister as direction-challenged, opted to ask around at the junction of the highway Siniloan and Famy and discovered it's near the poblacion of Siniloan. On going to the former Pandeño Bakery, reportedly owned by a foreigner from the US of A, Tutubi even got lost (deep into Halayhayin St.) while avoiding a one-way street sign at the corner of Pandeño Street and Salubungan only to find out later that it's a misleading sign that should be corrected by town authorities. 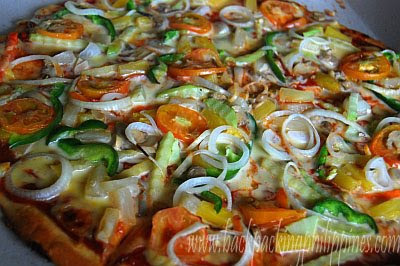 Tutubi's ate ordered two family size pizzas (about 18" in diameter): a pepperoni (price: P260.00) and a vegetable pizza (P200.00), plus a burger with fries (P115.00, about the size of two regular hamburgers of Jollibee). Tutubi prefers the vegetarian pizza with these ingredients that he was able to identify: tomatoes, onions, bell peppers, pineapple, sweet potato (camote), and mushrooms. 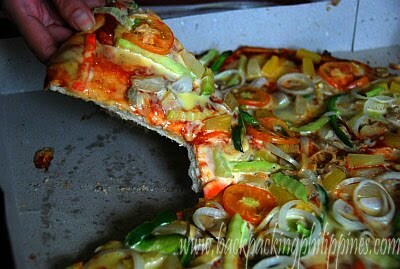 The crust is not like popular commercial pizzas (Pizza Hut, Shakey's) and the taste is tuned more to the Filipino palate-- more like Greenwich sans pepperoni, sausages and other meats. 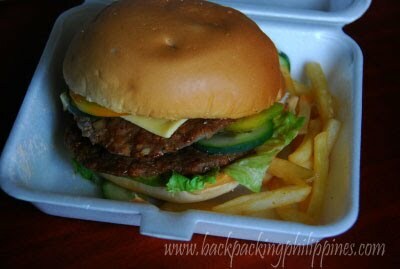 It's price at P200 is unbeatable, suited for a small town, that can feed a typical family. In the future, some sort of Laguna Food Trip itinerary featuring various Laguna delicacies complete with directions and GPS coordinates. Location: near Siniloan Municipal Hall, St. Peter and Paul Parish (Siniloan Church) and Jollibee Siniloan. Parking is a problem there as Pandeño St. is where public utility jeepneys bound for Siniloan pass by, too narrow as a two-lane road. You can park at the church patio for P20.00 parking fee if you don't want to risk your vehicle with scratch marks later. that veggie pizza looks sublime. watering my mouth. I have spent a portion of my childhood in Halayhayin since I went to a gradeschool there. On the other hand, I have friends in Pandeno. It was so nice reading and reminiscing through your post. I apologize for not getting in touch with you immediately about the recos. You might want to try the special palabok and "abnoy" in the stalls (but carinderia style) inside the Siniloan Market, KM3 Restaurant - I think it was recently renamed (especially the sisig) near Famy, and halo halo shop in Pakil. Long time no hear !